Fresh cream gateau from the Gateau House website. While you or I could easily whip up a standard cake ourselves by following various recipes from a magazine or cookbook, not many people attempt to make the Western-style cakes* that are sold in Asian countries like Hong Kong, Korea or Vietnam (I was surprised to read this style of cake is also eaten in Mauritius.). Partly, I think it is because people in Asia don't tend to have an oven (they are more likely to steam cakes instead). But it doesn't help that there are not many recipes published for the cakes sold in Asian bakeries**, and they are often quite elaborate and challenging to make at home. * I say "Western-style cakes" because traditional Asian cakes are a different beast, from the thick and dense mooncakes, to the chewy, steamed, bite-sized kuih. ** By "Asian bakeries", I mean bakeries similar to those you would find in Asian countries, not old-school bakeries that happen to be run by Asians. There are now plenty of Asian bakeries in Auckland, including Gateau House, La Couronne, Classic Bake House, Well-done Bakery, and Rio Kitchen. It turns out the part of the cake which I had always thought of as "sponge" is only sponge in the general sense, an umbrella term for foam cake. 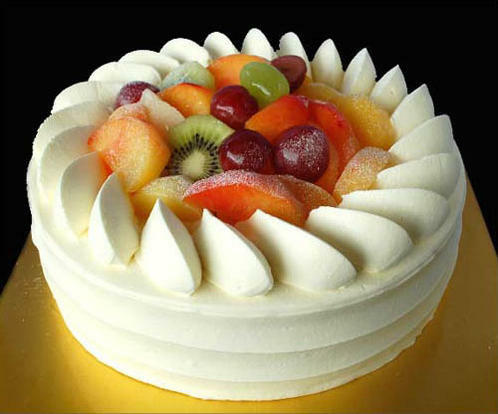 The particular kind of foam cake used in Asian bakery cakes is actually a reduced sugar chiffon. You'll end up with a lighter texture than if you used a standard sponge recipe anyway. Whole eggs Butter Airy, relatively dry Rich flavour from butter. Less sweet than other foam cakes. Eggs are warmed before beating in sugar. Whites and yolks whipped separately Oil Moist, light and springy Rich flavour from oil. Often has added baking powder. Whites only None Delicate, light and airy Highest sugar content to support egg whites. As you will see, the whipped cream topping was the part I struggled with the most. Freshly whipped cream tastes amazing, but I either overwhipped it and made it grainy, or it wouldn't hold its shape, and the cake looked like a mess by the time we went to cut it. No matter how hard I tried, my whipped cream did not have the amazing airiness and staying power of the commercial cakes. I'm not sure what professional bakers use, but I wonder if it might possibly be an imitation whipped cream like Cool Whip or Pastry Pride, though I haven't seen these for sale in New Zealand, and I assume the flavour wouldn't be that great. The Cool Whip ingredients look pretty unappetising, with the main ones being hydrogenated vegetable oil and high fructose corn syrup, and containing less than 2% cream. Bakel's NZ has a new Easy Whip product that is made of dextrose, skim milk powder, vegetable oil, sugar, and stabilisers and emulsifiers. I guess that might be what you are eating if you buy something from those cheap, run-down bakeries. Cool Whip Original ingredients from Kraft Brands website. According to some posts online, whipped cream in bakeries holds up longer because it has a higher fat content, or has stabilisers added, such as pectin, xanthum gum or guar gum. 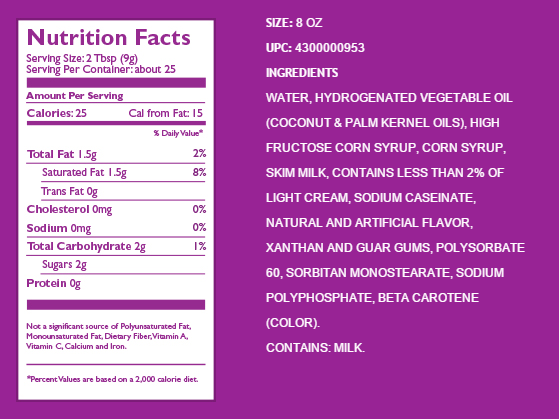 Dr Oetker's Whip It product (available to home cooks in North America at least) contains dextrose, modified corn starch, and tricalcium phosphate. You can achieve amazingly airy whipped cream by using canned whipped cream, as in Tatua's Dairy Whip. Nitrous oxide (N2O) is mixed into the cream and when pressure is released, foams the cream up to four times its liquid volume (compared to whipping by hand which only doubles it). Unfortunately, this whipped cream does not last long, and will go back to liquid form after 20 - 30 minutes. Adding milk powder - this was actually the only method I tried as I happened to have milk powder I wanted to use up. It didn't seem to make much difference for me though. Dissolving gelatin in hot water, then mixing into cream - the most popular method on the web, but you have to use it quickly after making it. Some also add cream of tartar. Using agar agar - vegetarian substitute for gelatin, either using the same amount or less. Cooking cornstarch before beating into cold cream - easy method but can give a grainy texture or floury flavour. Mixing in crème fraîche - also makes the cream tangier. Also, there's a buttercream recipe (fresh cream not needed) with rave reviews, which apparently has the texture of light whipped cream and is not too sweet. I'll definitely have to give this a go some time! My parents gave me a bag of fresh chestnuts, so I decided to bake a cake with them in it. It really is a labour of love, because shelling chestnuts is a time-consuming exercise! Most recipes tell you to cut an X into the flat side, but I found it easier cutting a single slit along the rounded side of the chestnuts. Although I had a tray full of roasted chestnuts, there was not enough there for the chestnut chiffon cake recipe I wanted to try, so I supplemented it with tinned chestnuts too. Canned chestnuts (left) and roasted fresh chestnuts (right). The sponge came out beautifully, though it did not rise much, presumably because I used baking paper, and did not invert the cake after baking. I used the fresh chestnuts in the lighter whipped cream topping, and the canned chestnuts in the intensely dark and delicious caramelly filling (enhanced with a nut flavoured liqueur). I need to work on my technique a bit as the final cake was on the dense side, but the flavours were worth the effort! A slice of chestnut chiffon cake. Making a taro cake is a lot easier, because you can simply buy frozen taro from your local Asian grocer and steam it—it's not such a fiddly process as boiling, roasting and shelling fresh chestnuts. I used a Japanese chiffon cake recipe, and Eupho Cafe's taro filling (minus the coffee creamer). The chiffon cake came out very springy, but I found its flavour overwhelmingly eggy. The taro filling was lumpy and solid when I first mixed it, but once I put it into the food processor for a few minutes, it turned into a smooth and fluffy spread. Taro filling, smooth filling on top, lumpy filling at the bottom. If it weren't for the strong egg flavour in the sponge, this would have been an excellent cake! In an attempt to reduce the egginess of the cake, I tried making an angel food cake, which only uses egg whites. Unfortunately, I lined the bottom of the pan with a circle of baking paper this time, and it made a crater when the cake was turned upside down. Curved bottom of angel food cake. It was also cloyingly sweet, though it did have a very soft and light texture. I ended up chopping it into cubes, coating it in dark chocolate, and palming it off to workmates. Levelling the bottom of the cake. Next, I tried Nasi Lemak Lover's Vanilla Sponge Cake. It had me baking the cake for over an hour, which was a lot longer than some other recipes, though admittedly at a lower temperature and for a higher volume of batter. The top of the cake split, and the outside seemed to have browned too much, so it was a bit dry and overcooked. ... but still cracked after further baking. Although I turned it upside down for cooling, it actually shrank upwards (away from the bench), and ended up being pretty dark as well. The taste and texture of the sponge were pretty much perfect once I cut away the unsightly parts though. With the chiffon sorted, I mixed up my own durian filling using about half a frozen durian (it takes a good few hours to thaw!) and about the same amount of sweetened whipped cream. I should have used a bit more sugar to bring out the flavour of the durian, but it seemed fine on its own, and I forgot to take into account the fact that the sponge part was not very sweet either. Creamy flesh of thawed frozen durian. I decorated the cake with whipped cream mixed with a bit of milk powder and icing sugar, and also added some slices of dried durian candy. Not the most beautiful of creations, but you'll love this if you like the aroma of durian! For my final cake, I made a mango chiffon cake with a layer of pudding mix in the middle, as well as custard (okay, maybe pastry cream is more accurate) and tinned mangoes. I used the same chiffon recipe as before, but placed a piece of foil over the pan to protect the top of the cake once it started browning. I didn't get the same splitting and dark colouring I saw earlier, but it still sank even after being cooled upside down. Some sinking in my chiffon. Once you slice the top off, it doesn't really matter anymore though! I added less water to the mango flavoured pudding mix than instructed, so that it would have a more intense fragrance, but it was very sweet, so I thinned it out a bit again. I poured the liquid into a springform cake tin lined with baking paper, which wrinkled up from the moisture, as you can see in the picture below. After refrigeration, it set into a very slippery round of jelly which smelt more mangoey than real mangoes themselves. Although the jelly sat on top of the cake layer with no problems, the next layer (pastry cream with mango pieces which I dolloped on top) threatened to slide right off. Pastry cream and mango layer on top of the pudding layer. Indeed, that is exactly what happened, after the cake was transported to a restaurant, put in the fridge, and taken out again at the end of our meal. The entire top half of the cake shifted slideways, making it look like a spectacularly chaotic heap. Top half of the cake slid to one side. Looks aside, the cake tasted better than I expected, thanks in no small part to the Asian mango pudding mix, which also added an interesting texture contrasting with the softness of the cream and the sponginess of the chiffon. Thanks, artificial flavours and colours! A very thin but tasty slice of mango chiffon cake. This post is part of Our Growing Edge, a monthly blogging event aimed at inspiring us to try new things. This month, it is hosted by Pia from Joie de Vivre and Cupcakes, with the theme "party with friends".